Captured Austrian Colors at the Battle of Hohenfriedberg in 1745. 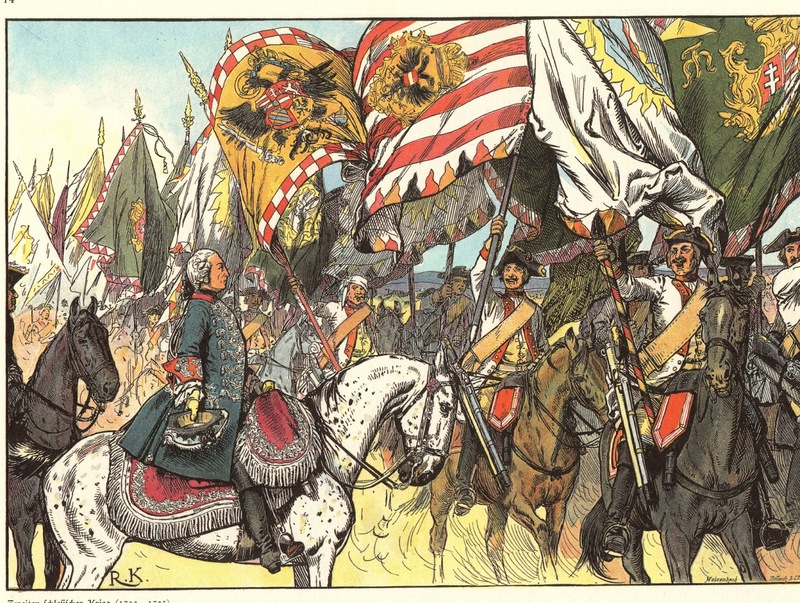 One of the attractions of building armies for the War of the Austrian Succession is the variety of unusual flags that were carried by the Austrian army during this period (1741 to 1748). 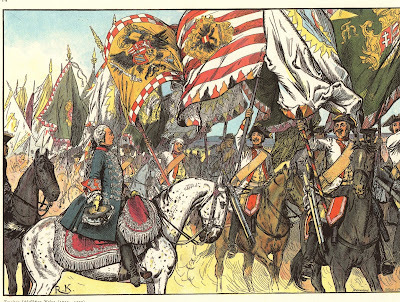 The famous print by Richard Knotel depicts the Bayreuth Dragoons parading all of the captured Austrian colors after the Battle of Hohenfriedberg in 1745. Instead of the familiar SYW Austrian flags with the yellow field and alternating red, yellow and black flames, we can see some flags bordered in a checkerboard pattern or triangles rather than flames. It is these different flags that has drawn me towards the period and the decision to build and paint my own WAS Austrian army that is distinct from my Austrian SYW army. Yes that is correct, Fritz now has two Austrian armies. The death of the Austrian emperor Charles VI was the event that triggered the War of the Austrian Succession in 1741. His daughter, Maria Theresa, inherited the thrones of Bohemia, Hungary and Austria as the queen of each of those lands, but Salic Law prevented her from having the title of Emporess of the Holy Roman Empire ("HRE"). In order to get around the Salic Law restriction, it was Maria Theresa's plan to have her husband, Charles of Lorraine, to be elected the new Holy Roman Emperor. Her enemies (Bavaria, France, Prussia and Saxony, among others) started the war that threw a spanner in the works and so the Elector Charles Albert of Bavaria was crowned as the new HRE Charles VII (not to be confused with the late Austrian Charles VI) in January 1742. Some silly law required Austria to remove all imperial insigna from its flags, including the colors black and gold. Thus new flags were issued to the army in 1742. We are getting a little bit ahead of the story, so let us go back to Charles VI of Austria and his flags. It was common practice that when a monarch died, new colors were issued to the army that bore the royal cypher of the new monarch. In this case, the old flags prior to 1740 has the initials "CVI" on them to indicate Charles VI. Normally, new flags bearing the initials "MT" for Maria Theresa would have been issued to replace her father's flags. However, time and money (the lack there of) delayed the replacement of the flags and so many Austrian regiments went in the field bearing the old CVI flags. John Ray has given me permission to post two pictures of Austrian flags from his collection (images are copyright of John Ray and may not be used without his permission) and these depict flags that were likely from the time of Charles VI, but still in use during the WAS. The striped flag as shown in the Richard Knotel drawing. Flag and figure from the collection of John Ray. John states that "my view remains, that flags possibly as far back as the late 17th Century may have been carried. Not in quantities as many were ravaged by war and time wear. However, given most hobbyists only show two flags to represent the many within a regiment, it is not inappropriate to use the last of the older flags a regiment may still of had. Dr. Stephen Summerfield in his book "Austrian Infantry of the Seven Years War" concurs that Charles VI flags were still in use during the early part of the WAS. His book provides a nice variety of flags illustrations from the reigns of Leopold I (early 1700s) and Charles VI. So if you are interested in using some of these early flags in your Austrian army, then this book is worth having in your reference army. The actual Charles VI flags, alas, are not readily available for wargamers from the companies that provide paper flags for wargame armies. One vendor, Pete's Flags, did two sheets of WAS flags, but the company doesn't seem to be trading any longer. Hopefully I am wrong about this and if anyone of my readers has information to the contrary or contact information, then please provide the information in the comments section of this blog posting. Nigel Billington has copies of the M1743 model flags and a couple of the Charles VI flags in his reprint of the book "Uniforms of the Seven Years War - Austria, Uniform Reference No. 2" . My recollection is that the original book was published by Greenwood & Ball in 1975, authored by J. Braithwaite. The pictures shown below were found in a google search on the internet. I believe that they are images of Pete's Flags. 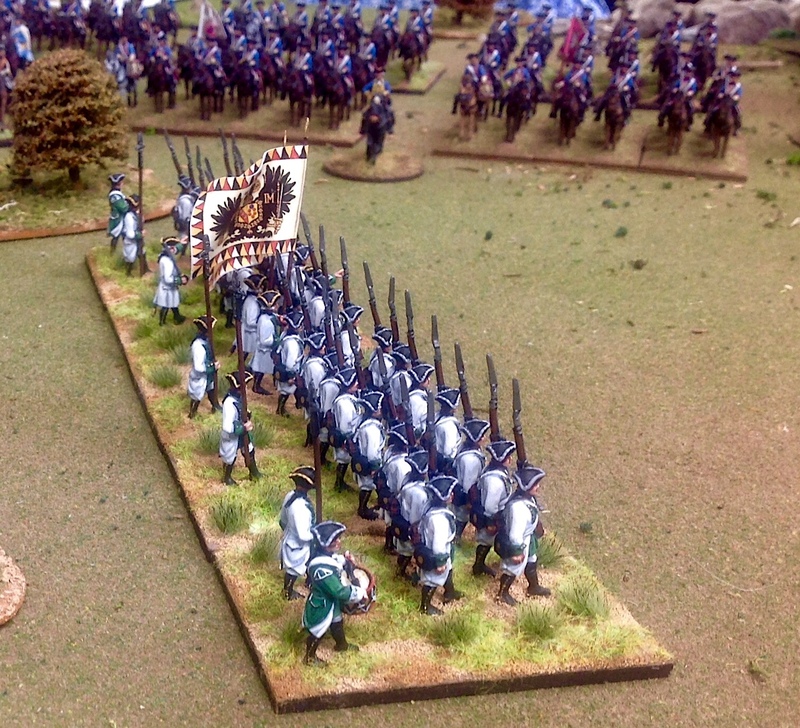 The standard bearer figures look like Front Rank Austrians. An attractive set of flags. The striped flag is from the Charles VI era and the green flag is the M1743 flag. In 1742, the Bavarian Elector Charles Albert was elected Holy Roman Emperor, so because the House of Hapsburg no longer held this position, it had to remove all imperial devices from its military flags, including the colors yellow and black in the flames pattern. Dr. Summerfield indicates that on October 19, 1743 all German and Hungarian regiments would carry a liebfahne with a white field and the Madonna in the center, and an ordinairefahne with a green field, edged with red and white flames on the flag. The flags resembled what we commonly refer to as the "Hungarian" flag, however in this case, all regiments carried this new flag, called the M1743 flag. Summerfield also notes that as long as existing flags were serviceable they were not replaced by the new pattern flags. The picture below is from the New York Public Library Collection, which is available on line. Again, Summerfield's book is a good reference source as it has seven illustrations of various M1743 flags. The model M1743 regimental "ordinairefahne" with the "MT" initials. HRE Charles VII died in 1745 and his replacement was Franz I (Charles Francis of Lorraine), the consort of Maria Theresa. Consequently, all of the imperial insignia could be restored to the Austrian flags. The new flags are the ones that we are familiar with as used by the Austrians during the Seven Years War. The M1745 liebfahne was white bordered in black, red and white triangular flames. On one side it had the Madonna and on the reverse side was the was the Austrian coat of arms - the black double eagle. The M1745 ordinairefahne had the familiar yellow field, bordered with alternating black-yellow-red flames and the double eagle insignia on both sides. 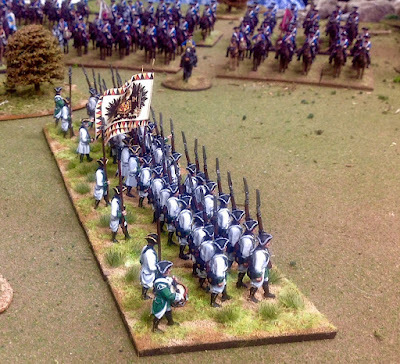 Here is an image of my new basing system for my WAS Austrian army. This is the Luzan Regiment and you can see that it carries the M1745 liebfahne. GMB Designs provided the flag. I hope that this article is helpful to anyone with an interest in the Austrian army, or anyone who would like to build a WAS Austrian army. Here is a work in progress of the Deutschmeister Regiment. I hand painted the flags. 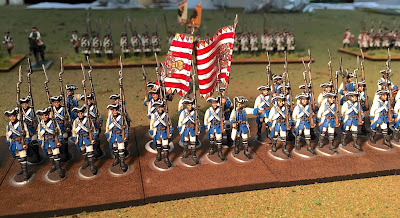 The figures are Minden Austrians painted by Scott Alexander. Search Pete's Flags on eBay to find his flag sheets. I think he's still in business, I've bought several sheets from him for the Italian Wars over the past months. I found one set of his flags on eBay recently. I wasn't able to find the second set though. I saw both sets on eBay a couple of days ago. I've been puzzled to find much in the way of Imperialist flags for the War of the Spanish Succession. Warflags offered a few, and not all of them are the traditional yellow flags with the Black Eagle, but I need more. The temptation is strong to use WAS designs. Get a copy of the Summerfield book because it has quite a few illustrations of Leopold I flags. NEW-CD ......$45.00 This is usually available in book form from the Pike & Shot Society in the UK, though it is currently listed as out of stock. They may advise you on reprint dates. So at present, the CD from OMM is the best option. This book is brilliant - all known detail on uniforms & flags as well as battles, etc. Good luck, Rohan. Yes Pete's Flags is still in business and I order often. Many thanks, Jonathan. Pete will love you...I just sent my order to him! Do you get a spotters fee? :-) Cheers, Rohan. You are welcome! No spotter's fee for me! Most interesting article, some cool flags l had never seen before. I have long thought that the WAS Austrian army is far more interesting than the SYW one. The uniforms are more colourful and varied while, as DAF has said, the variations in the flags are great and largely un-attributable meaning you can add whatever flags you like to whatever regiment. You sometimes find These old flags on contemporary paintings. A good source for old flags is Xenophon: http://www.xenophon-mil.org/milhist/austrianarmy/austrianarmytable.htm Please check the Prince Eugene plates. I used them for 4 of my Austrian batallions. Besides do you have correct figures for Hungarian infantry? The figure from PeteFlags from 2015 would be wrong for most of the WAS. As you will need different figures for hussars, because they didn't had those hight caps. They were looking more like on the Pictures by Gudenus (1735). Morier represents the uniforms from around 1748. But I assume that you will game the early part of the war - that means 1741-1745 (Mollwitz - Hohenfriedeberg). I think Dr. Summerfield states that the green "Hungarian flag" was not issued solely to Hungarian regiments, but rather includes the royal cypher of Maria Theresa as the Queen of Hungary. The flags were given to both German and Hungarian regiments. Jim, what great flags, and glad to see the "butterfly" stirring!! :-D WAS also has great flags for the Bavarians and the Dutch, too, as well as the usual armies! Cheers, Rohan.